It has been a week since Christmas lightings were up at Champs-Élysées. 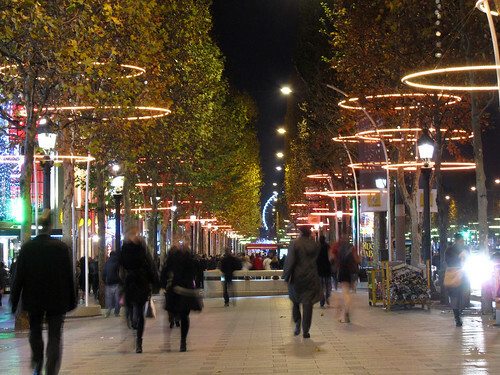 I have passed them by in the mean time, and I must say I am still not too convinced with this year’s idea of festive street lighting on this famous Parisian thoroughfare. They are rings of lights that changes colour, that’s all. I feel like I’ve been transported into a wrong futuristic movie or something. I’d like the traditional fairylights back, pretty please. In any case, there is a good reason for me to venture deep into Champs-Élysées today – to check out the newly opened Marks and Spencer, in particular, the food hall! After a decade of absence, M&S is back and it appears they are rather popular. There’s a queue to get in, and once inside, there’s another queue for the food hall. The food hall itself is small, consists of a single aisle with two rows of shelves on either side. Ah I had so much hope for finding things that I’ve been missing but alas, it’s not quite available here just yet.